It’s earnings time again and investors are back to watching the quarterly releases closely. This time as well, we expect the Energy sector to contribute the maximum to earnings growth for the S&P 500. 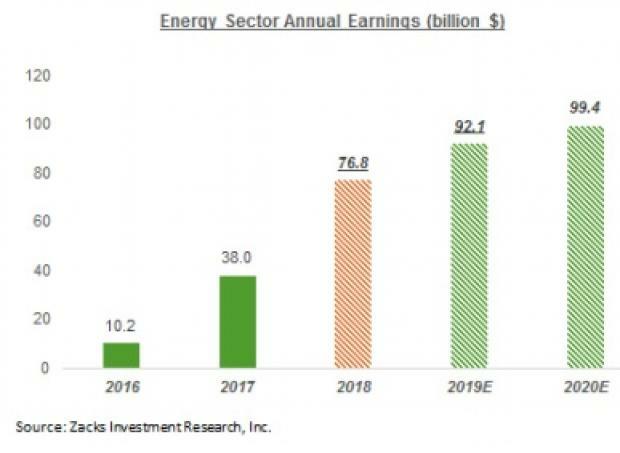 Our proprietary data shows that through the April to June quarter of 2018, Energy will generate $19.5 billion in earnings, significantly higher than the last four quarters. Overall, the sector seems profitable with sufficient free cashflows to fund growth projects. Since the recovering crude price is constantly backing Energy, it will be wise to include the ‘oilier’ stocks in one’s portfolio. Per the U.S. Energy Information Administration (EIA), the average West Texas Intermediate (WTI) crude prices for the month of April, May and June of 2018 was recorded at a respective $66.25 per barrel, $69.98 and $67.87, significantly higher than the year-ago monthly prices of $51.06, $48.48 and $45.18. Notably, the average monthly crude pricing scenario through second-quarter 2018 was the healthiest in three years. Supply concerns emanating from Venezuela and Iran amid robust domestic economy were constantly backing oil prices. Healthy oil price will likely be the prime factor driving the Energy sector in Q2. 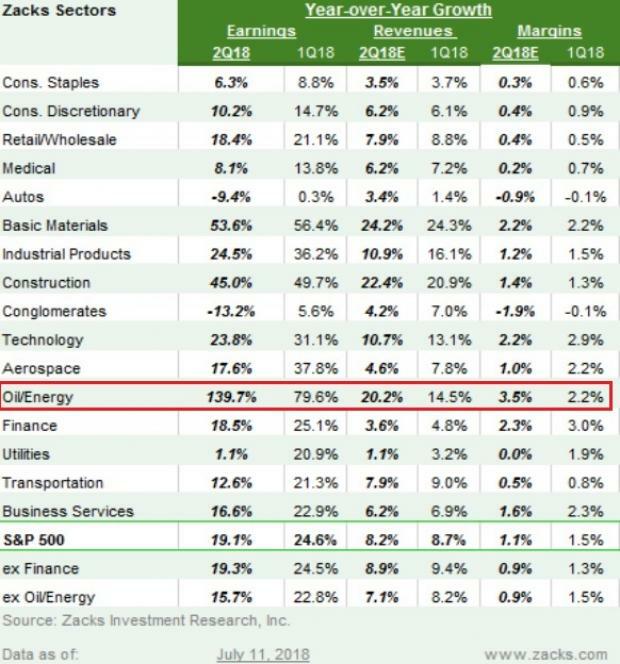 Among all the Zacks sectors defining the S&P 500, Energy is expected to be the only sector to witness triple digit year-over-year earnings growth of 139.7% in Q2. Importantly, excluding Energy, the S&P 500’s earnings growth in Q2 will likely drop to 15.7% from 19.1%. It is evident that the recovering oil price, after the commodity hit its lowest level of $26.21 since 2003 in February 2016, has been acting in favor of Energy. From only $10.2 billion in 2016, the sector’s earnings jumped to $38 billion in 2017. We expect the sector to rake in $76.8 billion through 2018. The weekly U.S. field production data of crude by EIA clearly shows rising volumes of oil through second-quarter 2018. The surging crude production amid favorable commodity pricing environment is expected to support oil exploration and production companies in Q2. Choosing stocks with earnings beat potential might be a difficult task unless one knows the way to shortlist. One way to do this is to pick stocks that have the combination of a favorable Zacks Rank #1 (Strong Buy), 2 (Buy) or 3 (Hold) and a positive Earnings ESP. Earnings ESP is our proprietary methodology for identifying stocks that have high chances of surprising in their upcoming earnings announcements. It shows the percentage difference between the Most Accurate estimate and the Zacks Consensus Estimate. Our research shows that for stocks with this combination, the chance of a positive earnings surprise is as high as 70%. In terms of production and proved reserves, ConocoPhillips COP — headquartered in Houston, TX — is the largest oil and gas exploration and production player in the world. More than 50% of the company’s production comprises oil. The stock currently has a Zacks Rank 1. The Zacks Consensus Estimate for its second-quarter 2018 earnings surged almost 10% over the last 60 days. ConocoPhillips, expected to report earnings results for the quarter ending June 2018 on Jul 26, has an Earnings ESP of +9.57%. EOG Resources, Inc. EOG — headquartered in Houston, TX — is among the leading exploration and production player with operations across the United States, the United Kingdom, China and Trinidad. The company’s production volumes consist of roughly 55% oil. The Zacks #1 Ranked firm is expected to report earnings results for the quarter ending June 2018 on Aug 3. The Zacks Consensus Estimate for its second-quarter earnings rose 6.2% over the last 60 days. EOG Resources has an Earnings ESP of +3.37%. Headquartered in The Woodlands, TX, Anadarko Petroleum Corporation APC is mostly engaged in exploration and production in the prolific oil plays in the United States. For the second quarter, the company expects its production to comprise roughly 56% oil. The #2 Ranked firm will likely release second-quarter 2018 earnings on Jul 31. Over the past 60 days, the Zacks Consensus Estimate for earnings for the quarter ended June 2018 has been revised upward by 16%. Anadarko Petroleum has an Earnings ESP of +26.65%. You can see the complete list of today’s Zacks #1 Rank stocks here. Based in Oklahoma City, OK, Continental Resources, Inc.’s CLR large and geographically diversified asset base includes resources in the Bakken Shale as well as the STACK and SCOOP plays in Oklahoma. The majority of the company’s total production is oil (57% in first-quarter 2018). The company with a Zacks Rank of 1 is scheduled to report second-quarter 2018 results on Aug 7. The firm’s Zacks Consensus Estimate for earnings for the quarter ended June 2018 has been revised upward by 17% over the past 60 days. Continental Resources has an Earnings ESP of +1.35%. Marathon Oil Corporation MRO, headquartered in Houston, TX, is a leading oil and gas exploration and production player with strong foothold in U.S. shale plays. The company’s production in the United States comprises roughly 58% oil and condensate. The #1 Ranked firm will likely release second-quarter 2018 earnings on Aug 1. Over the past 60 days, the Zacks Consensus Estimate of earnings for the quarter ended June 2018 has moved 25% up. Marathon Oil has an Earnings ESP of +9.88%.